Probably one of the most popular costumes for little children all over the world is the cow costume. This particular costume is a black and white cow print jumpsuit, lined to keep the baby warm. A red collar, adds a little color and a gold cow bell, let’s us know where he or she is. The hood has cow ears and little black horns. Slip on booties are fixed with non-slip pads that will keep your child from falling over. The usual snap locks ensure quick easy diaper changes are possible. 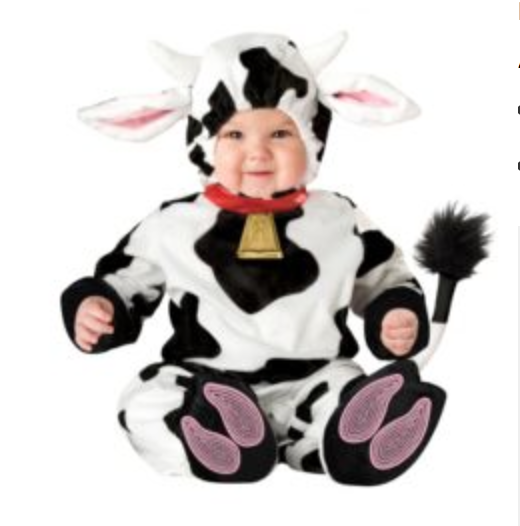 The Infant Toddler Mini Moo costume is one such outfit. All children know what a cow is and they know the sound it makes, with this costume, they can actually be a cow for a short while. Like the cows on Old MacDonald’s farm, your baby will be able to moo, moo here and moo, moo, there as he or she frolics about.